Since we’re enjoying that time in the season where the last of summer produce co-exists with the beginning of fall favorites, I’ve been trying to enjoy both while I can! We still have a container filled with fresh tomatoes from my mother in law’s garden (so much more flavorful than anything you could buy at the store) and I’ve been stocking up on the ripe, creamy avocados that don’t cost a fortune right now. My favorite part about the days I work from home is that I can take a little time to prepare a lunch for myself. 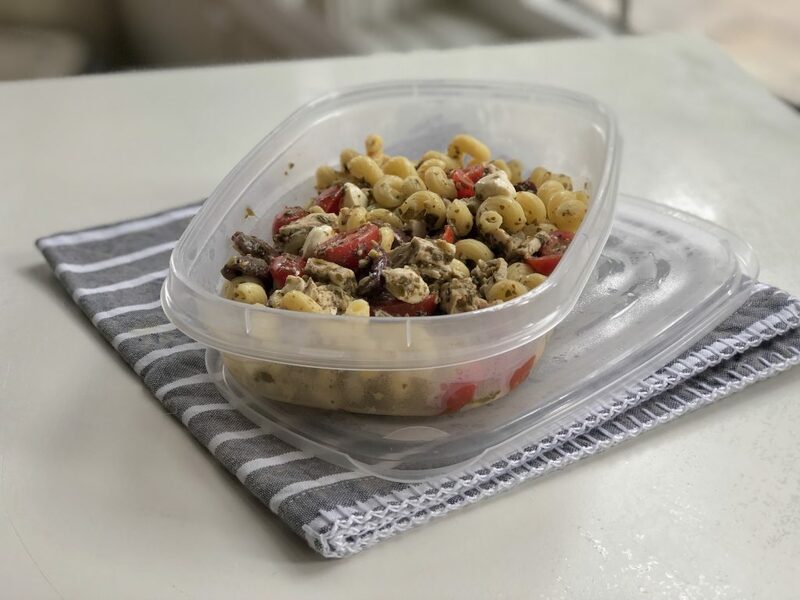 Instead of cramming whatever I can find in the fridge into my lunch container and running out the door in a rush, I have a fridge full of options at my disposal. Usually, I take the opportunity to prepare myself a giant salad packed full of whatever is on hand in our fridge. This salad is ultra-simple and doesn’t really deserve a recipe. But it’s also incredibly delicious and is worth mentioning in case you’re looking for a little lunchtime (or dinnertime) inspiration. *Toss the ingredients for the salad together. Serve with hummus and toast, if desired. Last week when I posted this salad that I take to lunch each week, lots of you responded saying you wanted to see more lunch ideas on Espresso and Cream. Sometimes my lunches are just a random assortment of whatever is left in the fridge, but other times I take a few extra minutes to prep something more reminiscent of a meal. 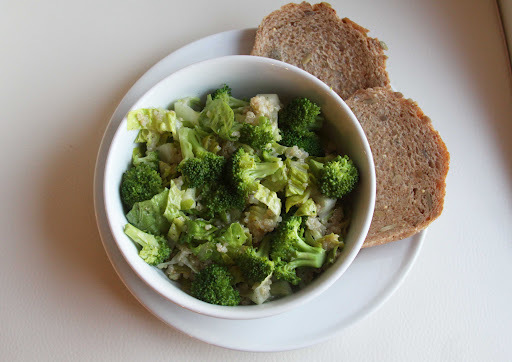 One of my favorite strategies for lunchtime success is to prepare a large batch of whole grains at the beginning of the week to go in lunches in the days to come. Quinoa, brown rice and whole wheat pasta are my personal favorites because they’re so easy. Here’s a look at what I ate this week! It was filling, veggie-packed and healthy. Though if I made it next time, I would suggest crumbling a bit of feta cheese atop the salad before serving, since feta makes almost anything better. 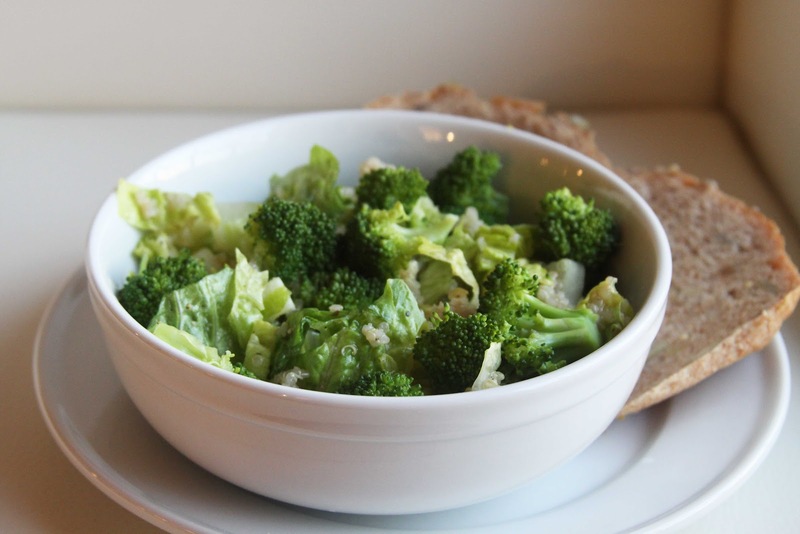 *Toss the quinoa, lettuce and broccoli together in a travel storage container. Just before serving, toss with the dressing and sprinkle with salt and ground black pepper. Serve with the toast. Enjoy! Lunches are difficult for me. Are they difficult for you? The whole process of packing a lunch, trying to find something in the fridge that will transport well and keep me filled throughout the afternoon. Something that’s not going to stink up the office fridge (which is already its own kind of disgusting). It’s really a drag, isn’t it? But since I’m trying to eat out less during the week and save us a little extra money, brown-bagging it is the way to go. A couple weeks back, I made an effort to specifically buy ingredients that would make for a killer salad. Avocados, feta cheese, hummus. And then I proceeded to eat this salad four days in a row. Sometimes when something is that good, you don’t get sick of it. 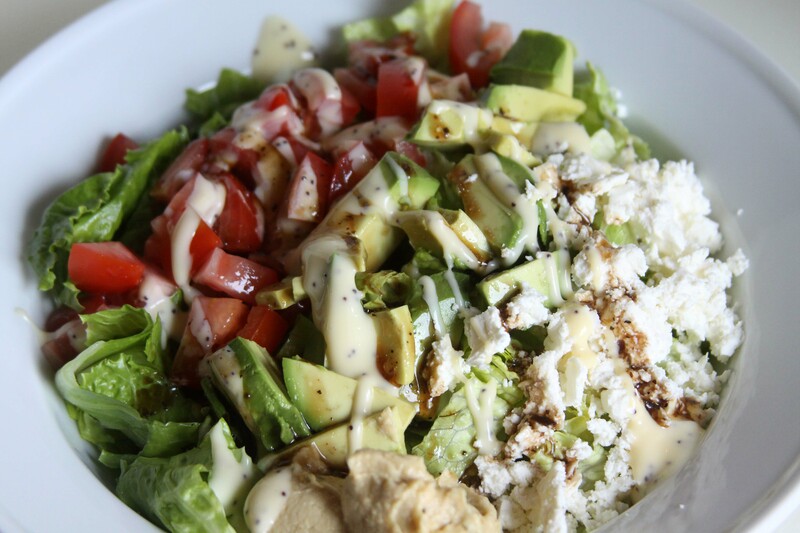 From a vegetarian’s perspective, this salad also meets my need for protein thanks to the hummus and cheese, and healthy fat from the avocado. Though you certainly don’t need to be a vegetarian to enjoy it, since my husband found it equally delicious. 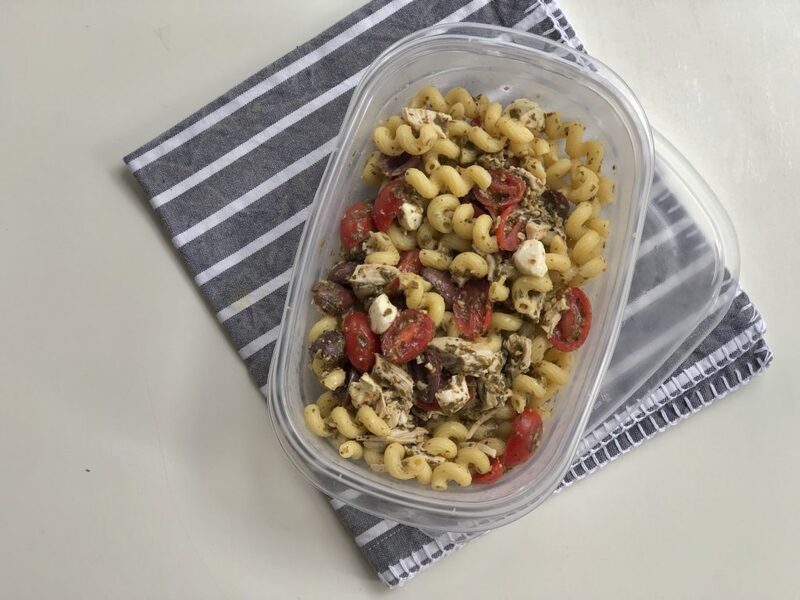 Now it’s your turn: What are your favorite ‘sack lunches’ to take to work? I’m always looking for new ideas to add to the mix. *Place Romaine in a sealable plastic lunch container. 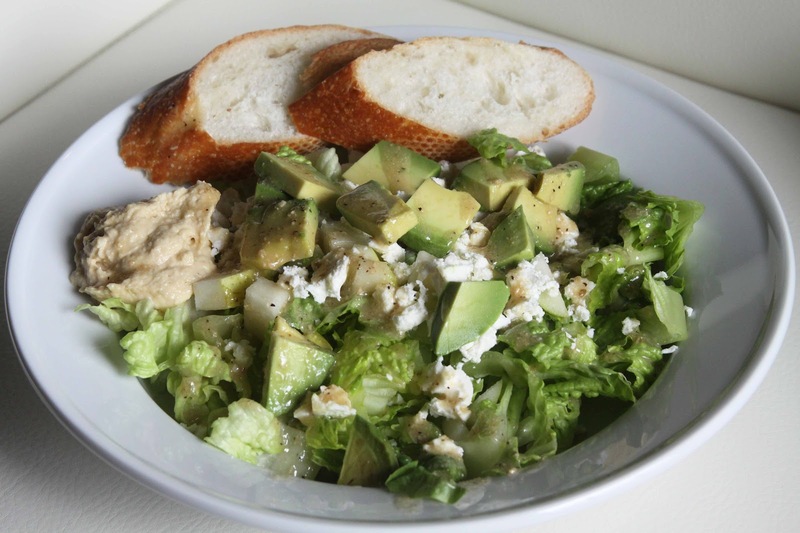 Top with the feta cheese, avocado and hummus. Place the dressing in a small container and toss right before serving. Serve with baguette, if desired. You know me. I’m all about simple weeknight meals. In fact, I think everyone I talk to is looking for more easy meals that don’t require a bunch of ingredients or a lot of time. This is especially true when it comes to meat. Being a vegetarian, most of my meals are quick to prepare. Roasted veggies, sauteed tofu, loaded up salads – they’re all quick and easy. So it’s probably no surprise that I have less patience when cooking meat for the hubs on weeknights. Before we got married, I had never cooked with a slow cooker. After seven months of being married, I’m not sure I could give mine up. Singe Joe is happy to eat meals that are much heartier than my preferred fare, the slow cooker is my savior. It cooks meat to absolute tenderness and does everything for me while I am away at work. 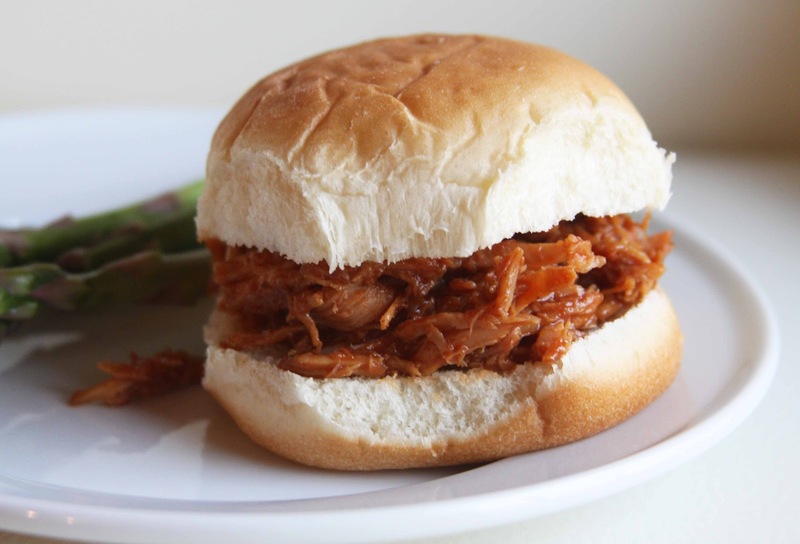 This ‘pulled pork’ (I’m using the term loosely for the barbecue purists out there) was a big hit tonight. Yes, it uses bottled barbecue sauce, ketchup and a tenderized pork loin. But it’s also practically ready to eat the minute you walk in the door. All you have to do is mix together the ingredients for the sauce and shred the pork. It’s really that easy. *In a 6- to 8-quart slow cooker, combine the pork loin, broth and water. Set the slow cooker on low. Cover and cook for 8 to 10 hours, until the loin shreds easily when pierced easily with a fork.